Greetings! I hope that you and your families are enjoying the final weeks of summer. Here in Santa Fe, the hottest weather is past and we are enjoying daily afternoon thunder showers which are most welcome in this part of the country. 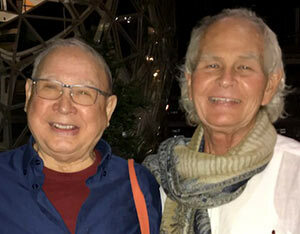 My wife Christine and I just returned from a few days in Seattle where we had a lovely post-birthday dinner celebration with Lino Tagliapietra and his wife Lina. We chose some great new pieces for my inventory, three of which are featured below. As always, I welcome your comments and questions. As mentioned above, we just chose some beautiful new pieces by Lino for my inventory. Here are three of those pieces and you can see all of the new works here. In the more than 30 years that I have been representing Lino, we have formed a close friendship which I treasure. 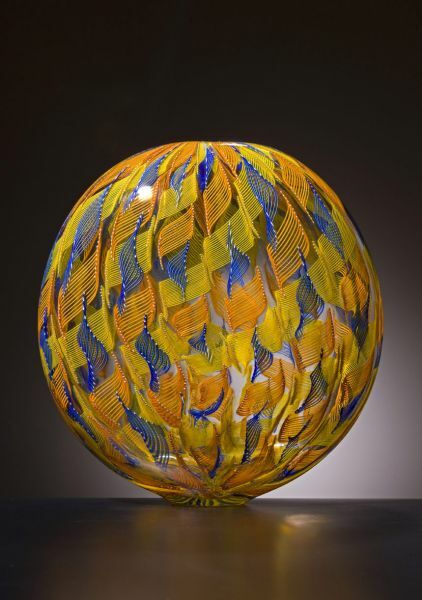 Although Lino and his wife Lina spend most of the year in their native Murano, Lino comes to Seattle several times a year to blow glass. We make it a point to visit Lino and Lina at least once a year and it is always one of the highlights of our year. Lino loves good food and good wine and is always so much fun to be with. I think that one of the highest pleasures in life is to be able to combine business and friendship in this way. I look forward to future visits with the Maestro and to continuing to show his magnificent glass sculpture for many years. I was excited this morning when Sid Hutter offered me this beautiful piece to feature in this month’s issue of Holsten Galleries News. 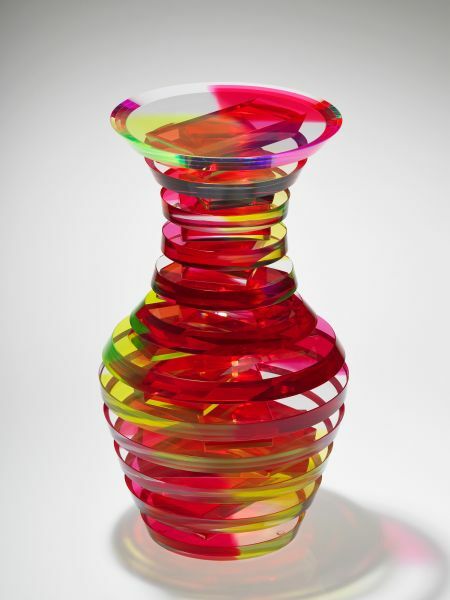 Like many of Sidney’s pieces, this one is optically kinetic and the colors change, fade, sharpen and blend as it is viewed from different angles. This is a particularly lovely example of one of Nancy Callan’s best known series, the Cloud series. 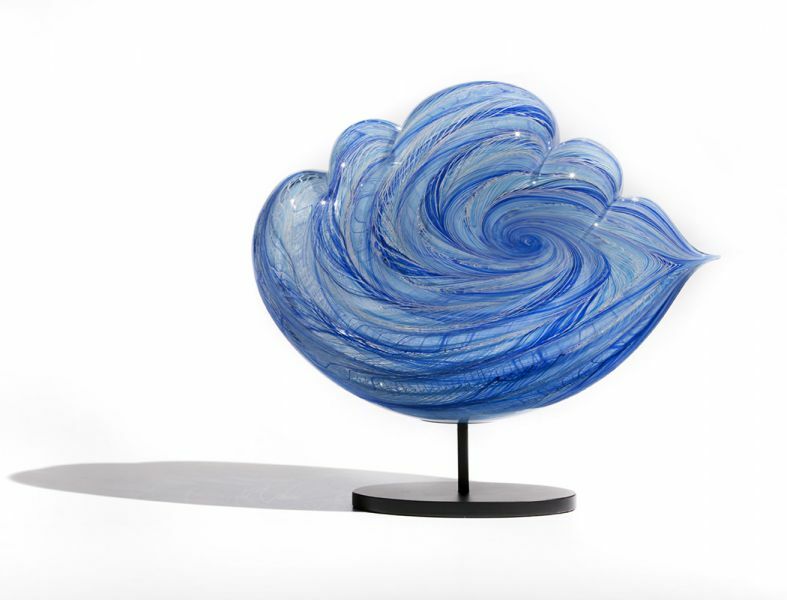 I love all of the swirly shades of blue and the graceful organic form which looks as if it could lift off at any moment and blow across the sky. 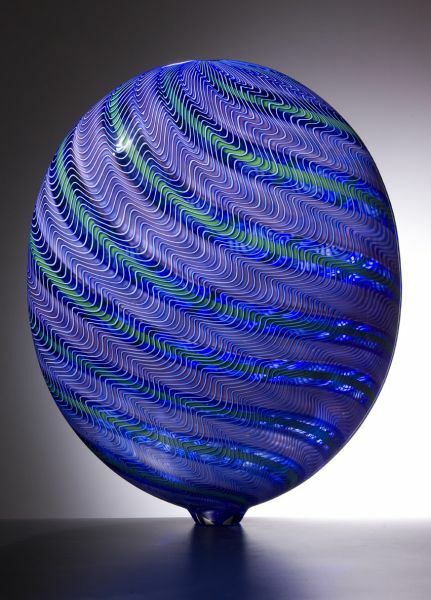 Embrace by Christopher Ries, 13.5 x 7.5 x 2.5"
Of all of the beautiful designs that Pennsylvania optical glass artist Christopher Ries has created over the many years of his distinguished career in glass art, the Embrace series may just be my all time favorite. 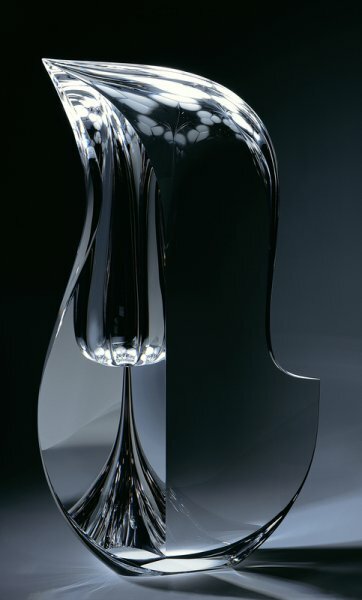 The graceful form of the piece reminds me of a musical instrument and the optics are such that this piece looks different from every view point. Images magically appear and disappear. Now you see it, now you don’t. The level of genius and technical skill of this piece continue to astound me after representing Chris for close to three decades! Thanks for taking a few moments to enjoy this months’s edition of Holsten Galleries news. 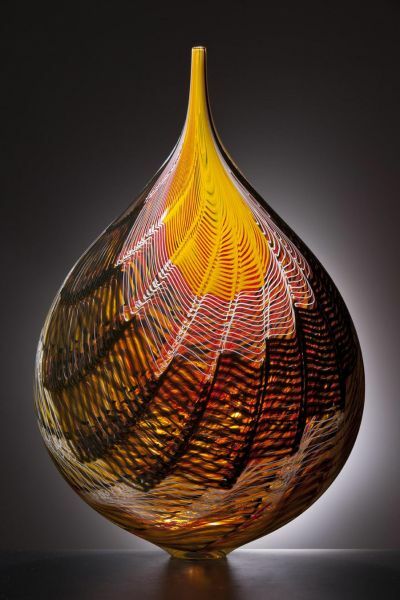 It’s always a pleasure to share beautiful glass art works with you. I look forward to staying in touch.